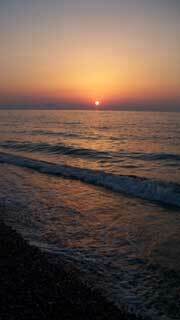 Platanias (Platanes) (Πλατανές) is situated on the north coast of Crete in the district of Rethymno (Ρεθυμνο). It has a fine sandy beach open to the north, with excellent views. To the west, you see Rethymno, with the White Mountains (Lefka Ori) providing a magnificent back drop, especially during Winter and Spring when the peaks can be covered in snow. Αlong the coast the view extends to Almirou Bay with the Akrotiri Peninsula in the distance. While to the east the beach extends to Skaleta. Looking inland you can see the tallest mountain on Crete, Mount Psiloritis, also known as Mount Ida (2,456m 8057ft). During the Winter months a small river flows from the mountains inland, crossing the western part of the beach to meet the sea. In the Summer and Autumn, the river is dry and it is possible to walk the course of the riverbed through the Prasiano Gorge into the mountains. 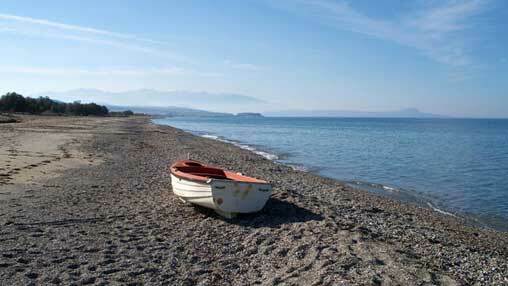 You can walk from Platanias to Rethymno along the beach. The distance is around 4km (2.5 miles). Many parts of the beach are equipped with wooden ramps and walkways providing easy access for visitors with disabilities to the sunbathing facilities. The Sea Turtle (Careta Careta) is a regular visitor to this stretch of beach which it uses as a breeding location. Please respect their nests of these endangered animals. The markers show the turtle breeding areas, please do not move them or disturb the sand near them. The beach has a Blue Flag Award. Platanias is an ideal holiday location, providing a wide range of accommodation, with many apartments and hotels being available all year round. Many of its tavernas, bars and shops are also open throughout the year.